Panasonic announced back in December that it was getting back into the smartphone game which made us assume that we would be seeing its new phone line-up at MWC 2012 – but the Panasonic Eluga was actually announced a few weeks early at the company's European conference in Hamburg, Germany. TechRadar was among the first people in the world to get a hands on with the phone and we're pleased to announce that it's actually a great-looking device. Panasonic has definitely got the stylists in to model the Panasonic Eluga – the phone has edges sharper than a catwalk model and is super-slim too. It measures: 123x62.0x7.8mm. 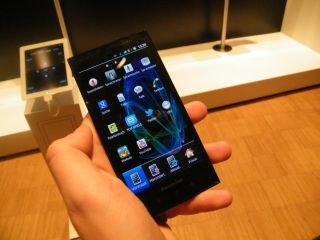 Because of this the Panasonic Eluga is one of the lightest phones around, at just 103g. To put this into context, the uber-light Samsung Galaxy S2 is around 113g in weight. We at TechRadar aren't just entranced by good looks, though, so when we actually spent some time with the handset we were pleased that it was swift enough to go from apps to camera back to apps again without much lag at all. The problem we had was that the whole thing was running on Android 2.3. With a bevy of Android Ice Cream Sandwich handsets sure to be released at Mobile World Congress, Panasonic needs to update this handset fast if it doesn't want to be left behind. When it comes to processing power, the Eluga has a 1GHz dual-core processor and its screen is big but not the brightest we have seen. The specs are impressive though, Panasonic has opted for a 4.3-inch qHD OLED 960x540 screen. The look and feel of the Panasonic Eluga is great, though. The phone's design is definitely premium and it's great how there are no buttons – other than virtual ones on the bottom of the chassis – which get in the way of the front and the sides of the device. Panasonic has been clever and put the physical buttons on the far side of the device, right at the very edge of the rounded back. This works well and means you don't accidentally knock them when using the phone. The Eluga has been given NFC functionality as well, which will be valuable when the technology becomes mainstream in the UK. Flip the Panasonic Eluga over and you have an 8MP camera on the back. The functionality of the camera was decent enough – we took a few images with it and shutter speed was swift. When it comes to the Android OS, Panasonic has been very kind to the software, not really adding much layering. The only real changes we could see were to do with the button layout at the bottom of the screen where you could get to your apps. With the Panasonic Eluga, Panasonic really wants you to buy into the Viera family and has integrated something called Viera Connect 2.0 (VieraRemote) into the device. Load this up and what you can do is 'swipe' anything you are viewing on to an internet-enabled Viera TV. This can be pictures, video and even websites. In our brief tests this feature worked well and could well push anyone who has already got a Panasonic TV to buying the Panasonic Eluga. The other standout feature is that the phone is waterproof - it's been given an International standard IP57 tag, which means it is protected for up to a depth of 1 metre for up to 30 minutes in water... A lovely lady dunked the phone into a goldfish bowl full of water for us and the Eluga survived. It's dustproof too, but we couldn't test this in a sanitised, dust-free convention centre. If it was down to looks alone, Panasonic has made a great return to the UK phone market but we need to see the Eluga running ICS before we see if it matched the rest of the top-end phone market for functionality. Panasonic has assured us that the Panasonic Eluga Ice Cream Sandwich update will be in summer 2012. The Panasonic Eluga UK release date is set for spring, with pricing and availability to be announced.